Sheboygan has kayak rentals, surfboard rentals, SUP (stand-up paddleboard) rentals, sailboat rentals, Segway rentals, bike rentals and fishing pole rentals available for your Lake Michigan family vacation! 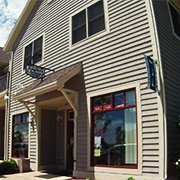 All are closely located to Sheboygan's, Lake Michigan shore and riverfront activities. 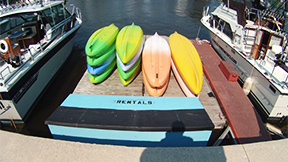 Check out the launch page to find all the kayak, canoe and board launch sites in Sheboygan. Be sure to tell them the "Sheboygan Fishing Guy" sent you! Hours: Mon. - Sat. 10a.m. to 7p.m., Sun. 11a.m. to 4p.m. 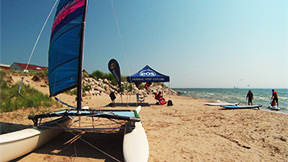 EOS (ee-os) is Wisconsin's first and only dedicated surf and paddleboard shop! They have kayaks, surfboards, SUPs (stand-up paddle boards), sailboats and wetsuits all available for rent. Their main surf shop is located at 510 North 8th Street, just 4 blocks North of the South Pier District's roundabout. They have boards and surf merchandise for sale, year round surfboard and wetsuit rentals, and seasonal rentals of their kayaks, SUPs and sailboats. Parking lot across from 666 South Pier Drive. Three exciting 90 minute guided tours available! The Sheboygan Lakefront, the Village of Kohler and the Old Plank Road Trail. 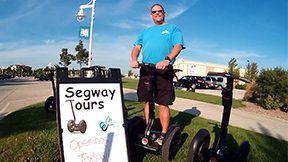 Tours include personal instruction and a helmet, with up to five gliders per tour. Book a tour on their website or give them a call. Hours: Mon. - Fri. 10a.m. to 7p.m., Sat. 10a.m. to 4p.m., Sun. 10a.m. to 2p.m. 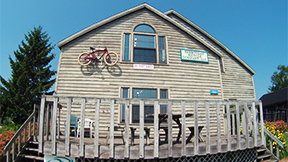 Sheboygan Bicycle Company, located on the north side river boardwalk, has bike rentals for the half day, full day or longer. They have well maintained, family orientated hybrid bikes that are easy to ride and very comfortable. Children's tagalongs and trailers are also available. Delivery is available at no extra cost. A bike from the Sheboygan Bicycle Company is a great way for your family to tour the Lake Michigan shore! Be sure to call ahead to reserve your bikes. Hours: Mon. - Thurs. 7a.m. to 7p.m., Fri. & Sat. 7a.m. to 8p.m., Sun. 7a.m. to 6p.m. Do you want to take the family fishing but don't have any fishing poles? Don't sweat it! Anglers Avenue has fishing pole rentals, fish bait, fishing lures and fishing licenses. Located on the south side river boardwalk, they have a dock out back on the Sheboygan River you can fish from or try your luck on the South Pier. If your fishing with worms in the river, fish close to the wall. If you want to cast for salmon and trout, try the Luhr Jensen, "Cast Champ" available at Anglers Avenue.